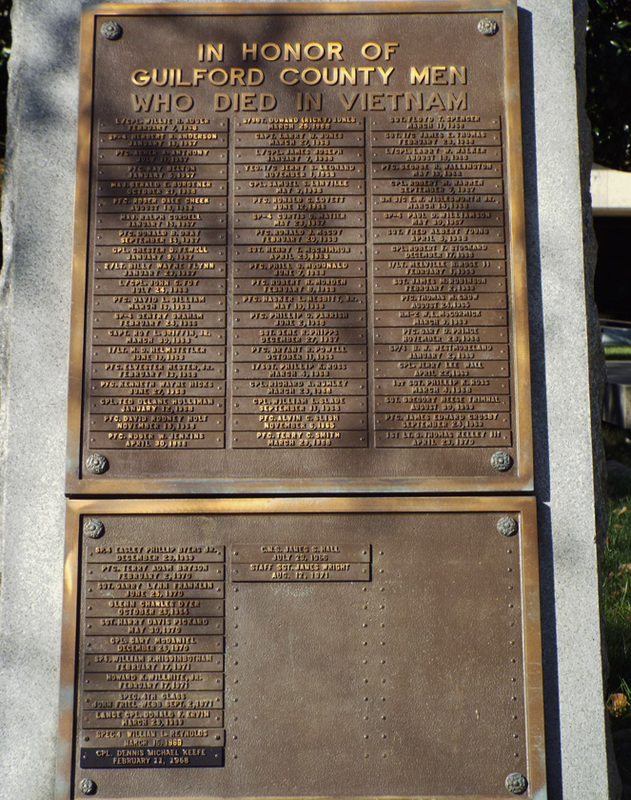 The memorial to men from Guildford County who died in Vietnam consists of two bronze tablets attached to a short granite block with a sloped front. They are unadorned aside from the inscription on the top tablet which also holds 60 names in three columns of 20 with date of death. The lower tablet is smaller and holds 14 more names with room for additions. A flag pole stands directly behind the granite block. 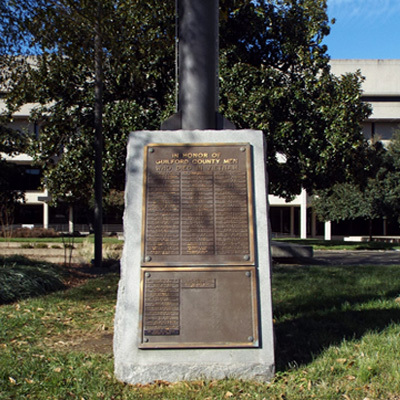 The flag pole and marker are located in a lawn area above a retaining wall near the northwest corner of the Phill G. McDonald Plaza. The plaza faces S. Green Street and is bracketed on three sides by the current Guilford County Courthouse to the west, the Greensboro Police Department to the south and the Old Guilford County Courthouse to the north. Memorials markers to Pfc. Phill G. McDonald and Iraq and Afghanistan War Dead stand right nearby. A short distance to the east is the Greensboro Millennium Gate. 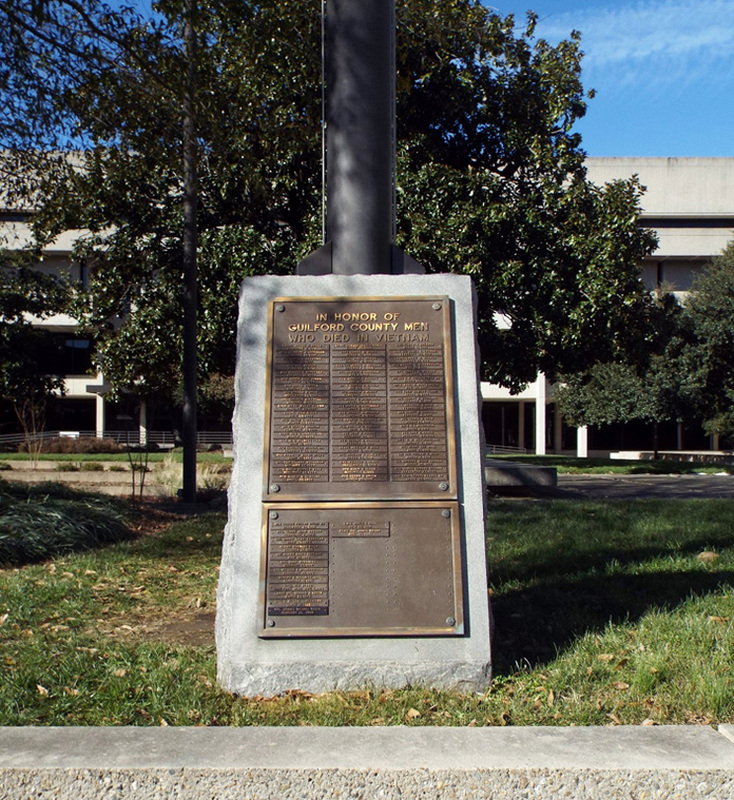 A short distance to the east and in front of the Old Guilford County Courthouse is the MSgt. Edwin V. Bain memorial marker. The memorial stands on a grass area with trees behind it.